This post contains affiliate links. I was compensated for my work in writing this post. 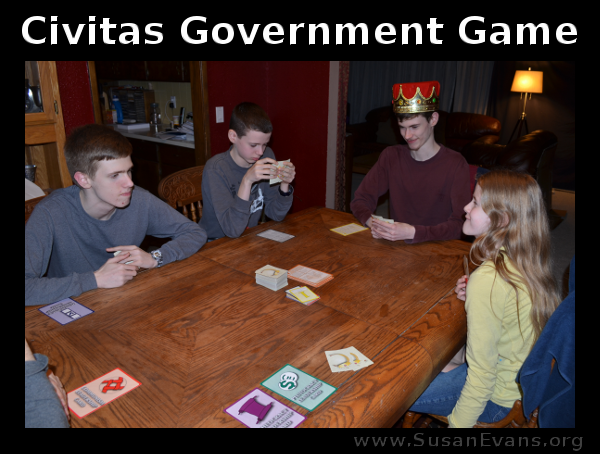 While studying high school government, my family won a copy of the Civitas government game by Bright Ideas Press. It was so much fun to play that we decided to write about our epic adventure with this game! Civitas is a government card game (Ages 10+), and it is especially good for high school students studying government. The players become familiar with many different types of government. 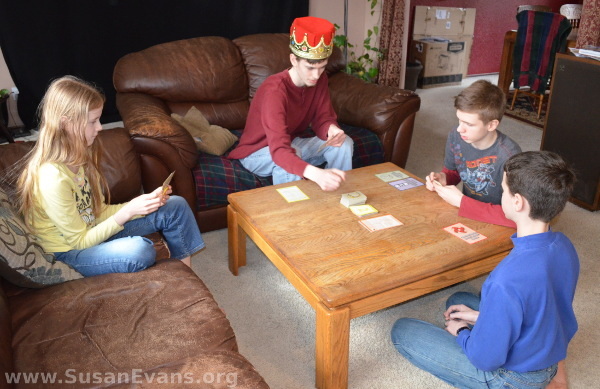 We decided to add hats to our game; we used a dictator hat, a crown, a pope hat, a military hat, and a top hat. You do not need the hats to enjoy the game. 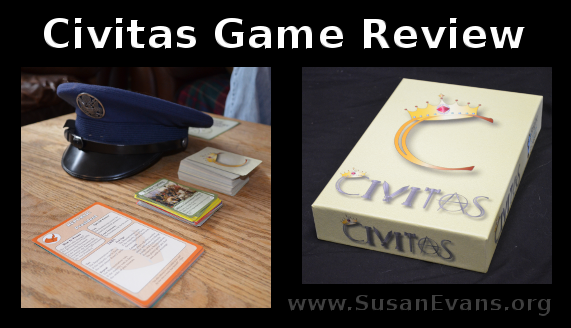 Civitas is a game about ruling all the players at the table with many forms of government. The goal is to have the fewest points at the end, and points are gotten by how many cards are in your hand and what type they are. The game ends when one player loses all of his/her cards. There are 8 decks for you to choose from, excluding the gray deck. Select whichever decks you want to play with (the game gets more challenging with 7 or more) and shuffle them together into one huge deck. You have to include the gray deck. Then 1 player (the dealer) deals 7 cards to each player, sets the huge deck in the middle, and flips the top card over onto a new pile (discard pile). This card determines the first form of government. The dealer gets the corresponding leadership card (one of the oversized cards that corresponds to the color of the face-up card) and places it beside them. The player to the left of the dealer goes first. They can do one of 3 things: play any card of the same government type (color) as the face-up card, play a number card that is the same number or color as the one in play, or play a wild or law card (anarchy cards count as wild). A player can choose to not play any card if they don’t want to, but they have to draw a card if they don’t play anything. When the government type changes, whether by a wild government change card, normal government change card, or number card, the leader of the existing government type has to flip their leadership card face down and the government type is changed according to the new government’s leadership card. The game started with Bryan (the dealer) getting communism, and ruling with an iron fist by changing the order of play, forcing everyone to draw cards, and other such nefarious actions. 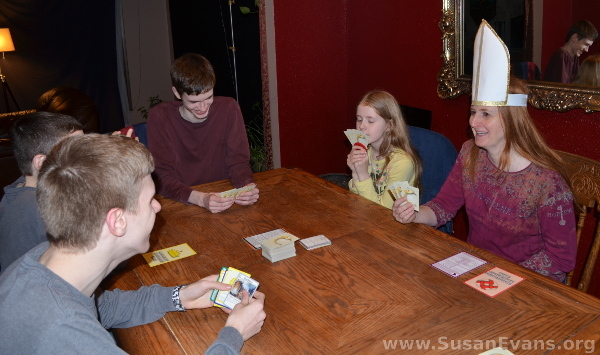 Then Stephen decided to make it interesting by playing Wealth Redistribution, which makes the player with the most cards have to give one card to the player with the least cards. It so happened that Nathaniel had the most cards and Bryan had the least cards, so Nathaniel was forced to give Bryan one card. Bryan stayed in power while changing the government type from communism to military (in order to exert more power over the people, no doubt). Soon afterwards Nathaniel rallied the people behind him and changed the government type to democracy, taking Bryan out of power. Bryan was not through, though, and brought the corruption even to democracy by playing Gerrymandering, and switching a full hand of cards with Rachel. The democracy could not stand under corruption, and it fell apart and gave way to Bryan taking power again, this time in the form of a monarchy. Bryan got his revenge on the usurper, forcing Nathaniel to draw two cards and exchange one card with Stephen. He even got sneaky and caused the order of play to be reversed so that he could skip Nathaniel’s turn with a coincidental Red Tape law played by Stephen. But Nathaniel would not take all this lying down, and forced Bryan to abdicate to change the government type to democracy again. Not much happened before Stephen, tired with the seat of power dancing between Bryan and Nathaniel, started a civil war and took control of a military government. However, forcing Rachel to draw two cards was his mistake, as she took over the reins of government with a democracy of her own later on. Bryan, not one for sitting idly by, decided to ally himself with his old adversary and crown Nathaniel king of a new monarchy. Stephen, wanting another taste of power, almost immediately started a revolution, changing the government type to military again. All was quiet for many years until Nathaniel, who ever since the revolution had been planning a revolution of his own, put his plan into action. It worked flawlessly, planting him as the leader of a democracy once again. After a lawsuit or two, Bryan, unimpressed with Nathaniel’s governing job, crowned Stephen king of a monarchy. But Stephen didn’t impress Bryan with his leadership skills either, so Bryan decided to revisit the start and make Rachel the leader of a new communism. But the move was too late, as Nathaniel won the game with a well placed change to democracy. If this Civitas government game sounds intriguing to you, go buy it from Bright Ideas Press! 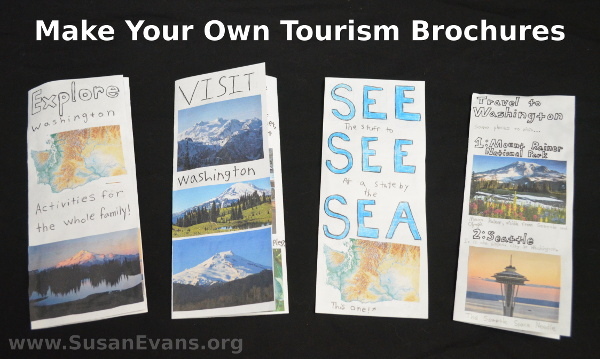 Today I will show you how to make your own state tourism brochures to help your kids understand your state better! We happen to live in the state of Washington, so we looked up what some of the famous sights of Washington are. My kids now understand the state of Washington way better than they did before completing the project! 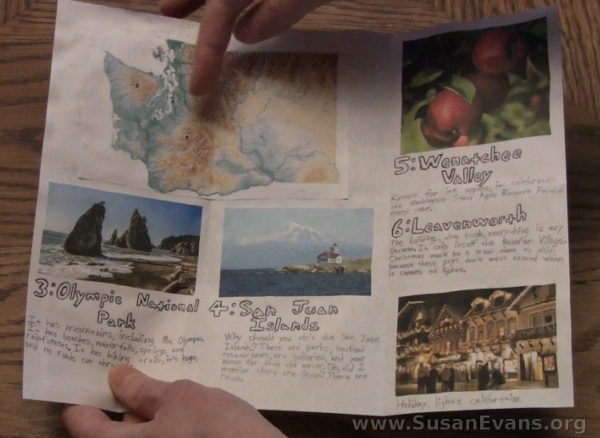 As you can see, we printed off maps and pictures, and we arranged them on a tri-fold piece of paper. The kids labeled and described different sights of Washington to cause tourists to want to come to our state. One of my sons had a humorous way of describing each sight. 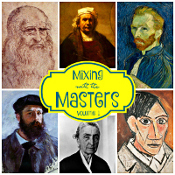 Create a bust sculpture of one of the Founding Fathers out of clay. Make a 3-D model of a real national feature or scene in one of America’s national parks. Create a slide show creatively illustrating the 10 Commandments. 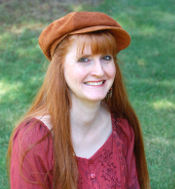 Write and illustrate a book for children of at least 20 pages explaining taxes and what government does with the money on a local, state, and federal level. Go on a field trip to your county courthouse. When teens have a creative outlet like skits or other hands-on projects, they have to think through the topic to a much greater degree than if they just took a test on the information. My kids wrote all the scripts for this entire high school government series, and they are learning so much! I hope you enjoyed our state tourism brochures. Stay tuned for the next episode: Typical Campaign Promises! The links in this series of blog posts are not affiliate links. Please buy the book from their website to bless their family the most! 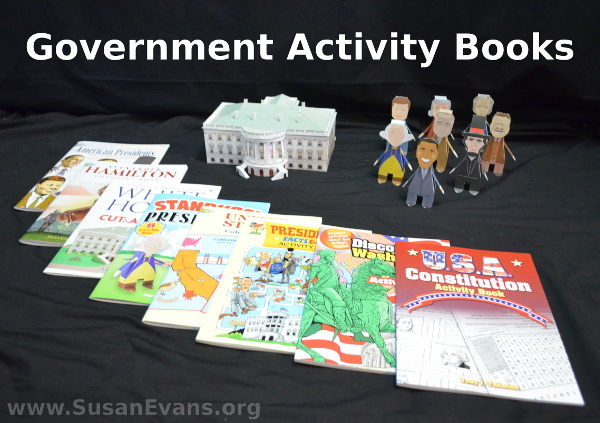 I received these Government activity books from Dover Publications for free and was compansated for an honest review. 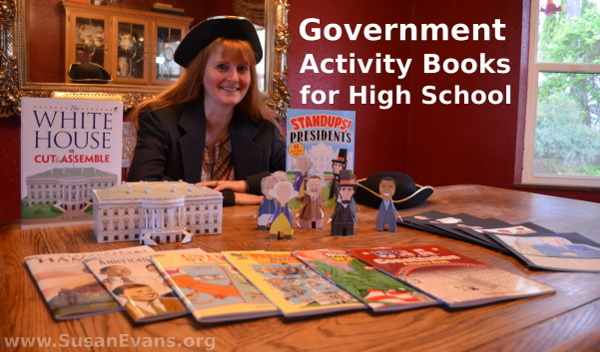 Since we have been studying Government in our homeschool this semester, I was overjoyed to find these Government activity books for high school! These hands-on activity books are perfect for all ages, but especially for high school students who are studying Government. You all know how I love hands-on learning. 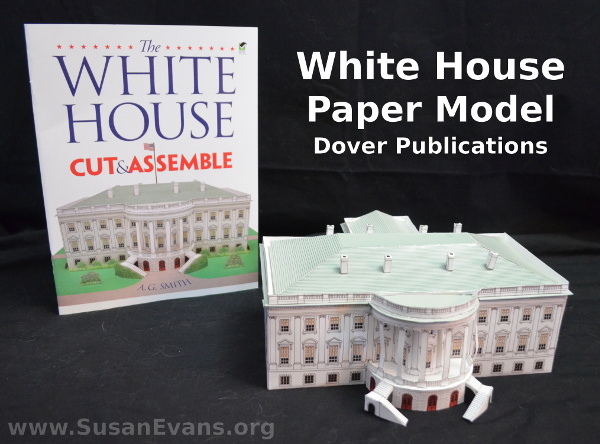 Well, these Dover Publications books include pop-up Presidents, a 3-D White House model, and activity books that include other hands-on craft ideas. There are coloring pages that can be used for notebooking, along with word searches, crossword puzzles, and code breakers. 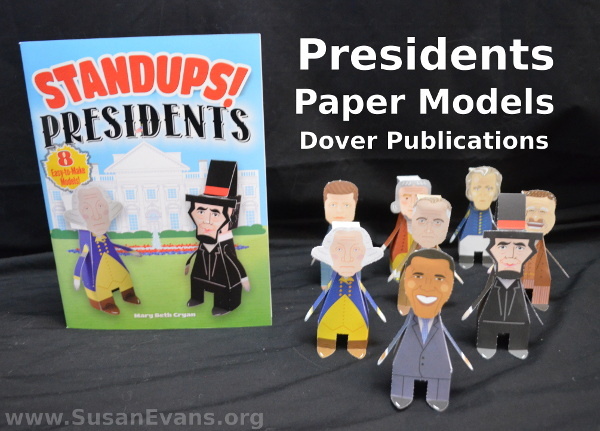 These eight paper models of famous United States Presidents include George Washington, Abraham Lincoln, Andrew Jackson, Theodore Roosevelt, John F. Kennedy, Franklin D. Roosevelt, Thomas Jefferson, and Barack Obama. The models are easy to punch out, since they are perforated. You can glue them together, and they look like a group of presidential penguins! 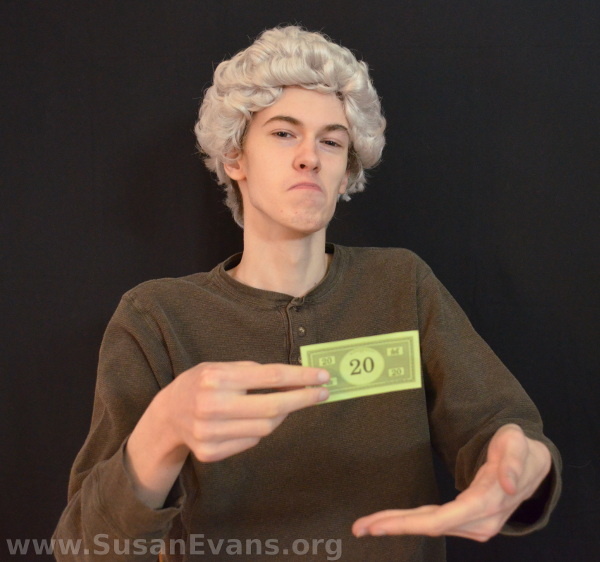 Writing assignments can include skits between two of the Presidents. The skit can be acted out with two students in front of an audience. You can pair up Presidents who might have had opposite views on different issues to make your dialogues more interesting. Since George Washington owned slaves, for example, he could talk to Abraham Lincoln about the Emancipation Proclamation. Barack Obama could re-define the Constitution and say it is a living document, and see if George Washington rolls over in his grave. Yes, you could make a pop-up gravestone to go along with this particular skit to promote interest from other teens who are taking Government class. You could even have a time warp cocktail party where all these Presidents are milling around with a glass of punch in their hands, trying to make small talk with each other. Ah, yes. This is what comedy shows are made of! We also put together a 3-D White House model. This is good for high school students, since the cutting and pasting is too complicated for small children. 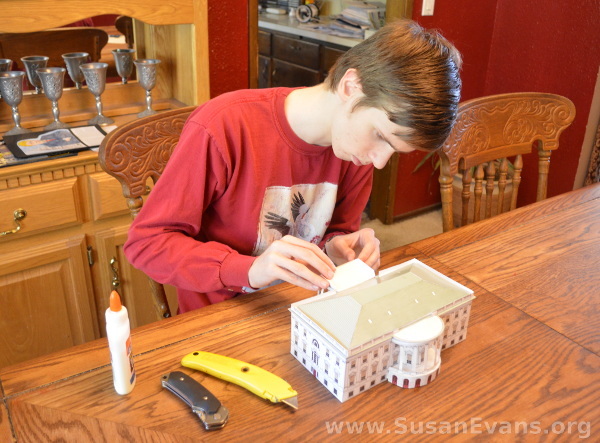 If you set aside several nights to put together the model, you will enjoy the process more. Hold the pieces that you are gluing together for at least 60 seconds before releasing. Two minutes is even better. If you are chatting with friends or listening to music, putting this model together is even more enjoyable. I think it is totally worth it to have a 3-D model of the White House for kids to look at. High school teens can do further study with library books and present a report about the White House in front of a co-op or classroom. 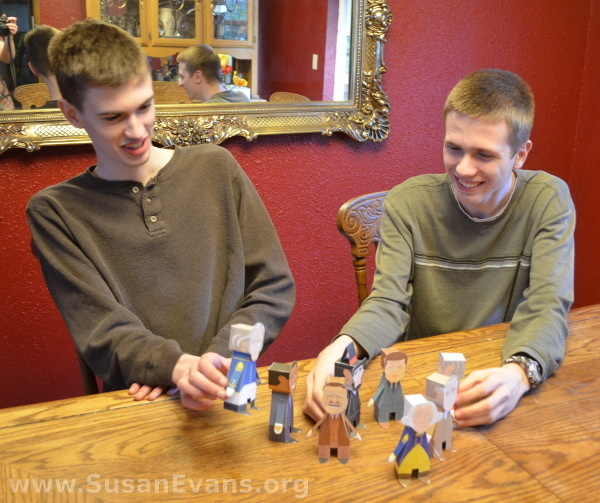 Younger kids can do a White House LEGO model like the simplified one we did several years ago. We learned about what each of the rooms of the White House contained. Some day I would love to take my kids to a tour of the actual White House! 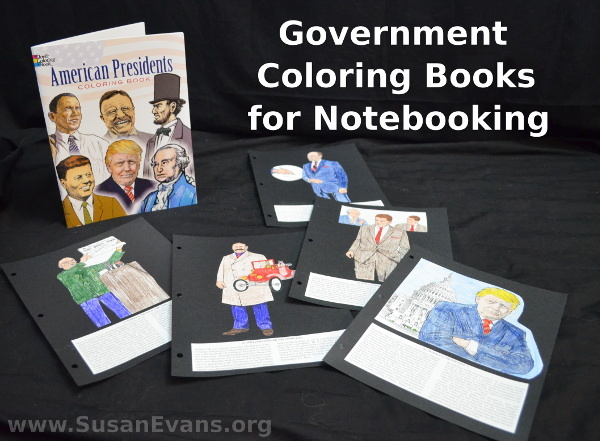 You can use these Government coloring books for notebooking. Simply color the pictures with colored pencils, and then cut and glue the pictures and information on black card stock paper. I always prefer black paper because it causes the kids’ work to pop. It really does showcase the artwork. You can also have the student write a report on a President and include the report in the Government notebook. Or include coloring pages from the Alexander Hamilton Coloring Book, and describe the situation depicted in the drawing. You can assign it from a first person point of view to make the teen feel like he or she is standing in that time period and experiencing the event themselves. If you do not win this giveaway, you can still purchase these fun materials from Dover Publications at a 25% discount with the code WHBO. Discount expires on June 30, 2017. 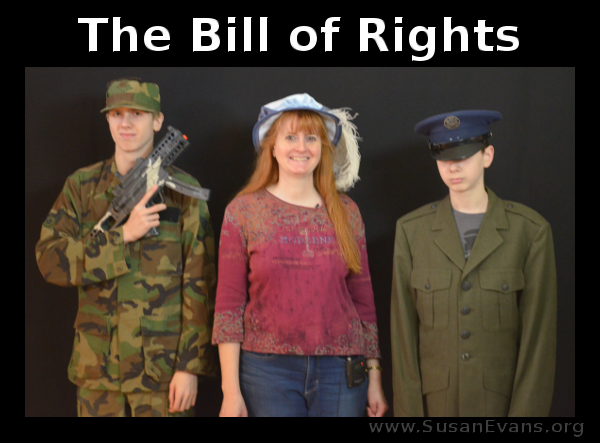 Today we will be dramatizing the Bill of Rights, the first ten amendments of the United States Constitution. These are our cherished freedoms as human beings, so they are quite important. The Notgrass Company has sponsored the furtherance of these fun and exciting blog posts, since we are basing our study completely on their Exploring Government book, which has made our learning of high school government a pleasure! Without further ado, we present to you our next installment in our government series, to familiarize you with the Bill of Rights. 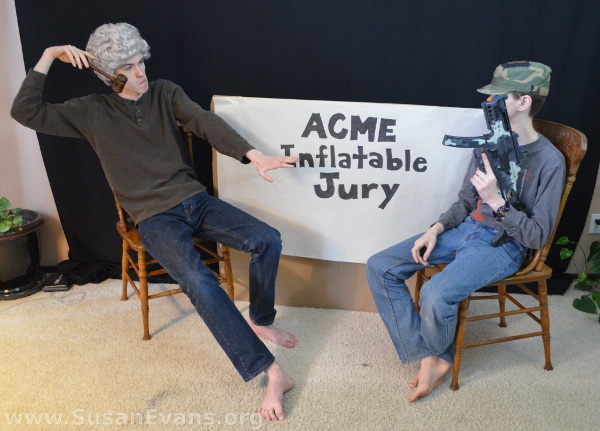 Feel free to perform these skits in your own homeschool co-ops and/or schools. In Suits at common law, where the value in controversy shall exceed twenty dollars, the right of trial by jury shall be preserved, and no fact tried by a jury shall be otherwise re-examined in any Court of the United States, than according to the rules of common law.